Along with the bust of Nefertiti the ankh has to be one of the most common symbols to be worn (or tattooed) by people of African heritage wishing to assert their connection to Kemet. But what exactly does the ankh represent? Like many Kemite symbols, the ankh remains somewhat enigmatic. 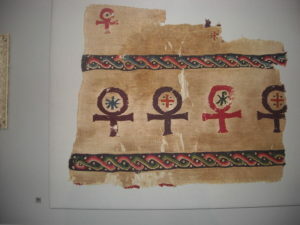 In Gardiner’s book on Egyptian Grammar the ankh is categorised under the heading of ‘Crowns, dress, staves etc.’ and is described as a tie or strap. It is listed as sign S 34. In 1925 Hastings suggested that the symbol was in fact a sandal strap. However, not all Egyptologists agree with this interpretation. In 1982 Schwabe, Adams and Hodge wrote a paper where they associated the ankh symbol with the thoracic vertebra of a large mammal. In their paper they argue that the ancient Kemite people believed that sperm was produced in the thoracic spine and thus the the ankh’s association with life, through fertility, was represented in this way. Irrespective of what the actual symbol represents, it is possible to understand what the ankh meant symbolically to the ancient Kemites by exploring its imagery. Sacred water represented by the ankh symbol. Kalabsha. Essentially, the ankh symbolised life. This can be seen by its use on temple and tomb reliefs from Kemet. 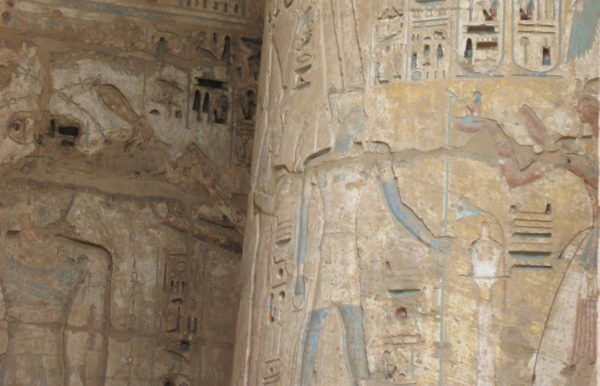 The photograph at the top of this section and directly below (on the left-hand column) show gods pouring sacred, life-giving liquid over the king of Kemet. These two reliefs were carved over 1000 years apart, and show continuity in symbolism and the preservation of Kemite culture. The ankh between a mirror image of the Kemite word for king. Hyperstyle Hall at Karnak Temple. The ankh was a divine, and by association royal, symbol. 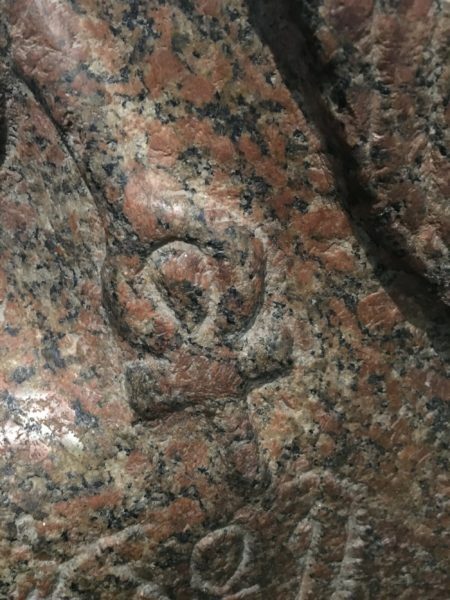 On the columns in the Hyperstyle Hall at Karnak temple the ankh appears between a mirror image of the Kemite word for ‘king’ and the cartouche of Rameses (II) Usermaatre-setpenre. Cartouche is in fact a modern French word that we use to describe royal names, which were typically written inside a shenu or shen ring, which protected the name. 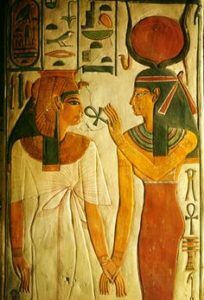 There are also numerous examples of another scene, in which a god or goddess touches a member of the royal family with an ankh, representing the giving of life. The scene above is from the tomb of Nefertari, who was the Principal Royal Wife of Rameses (II) Usermaatre-setpenre. Many of the scenes associated with the Afterlife in Kemet allude to life or rebirth because this was the process that the people believed their spirit would undertake. In this way the ankh was linked to fertility. 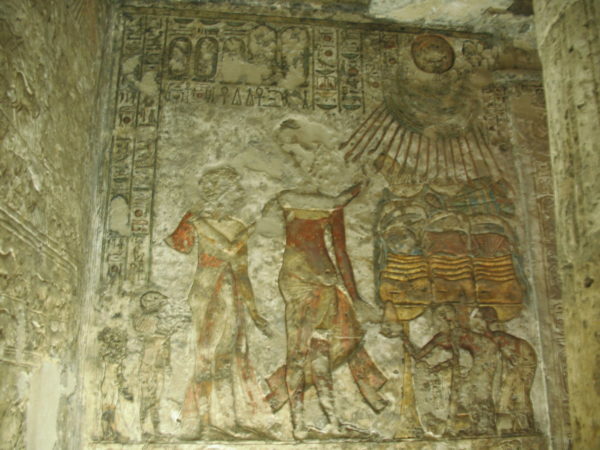 In the tomb of the artist Pashedu at Deir el Medina, which dates to around 3300 year ago (above) protectors of the gateway between life and the Afterlife hold the ankh symbol. 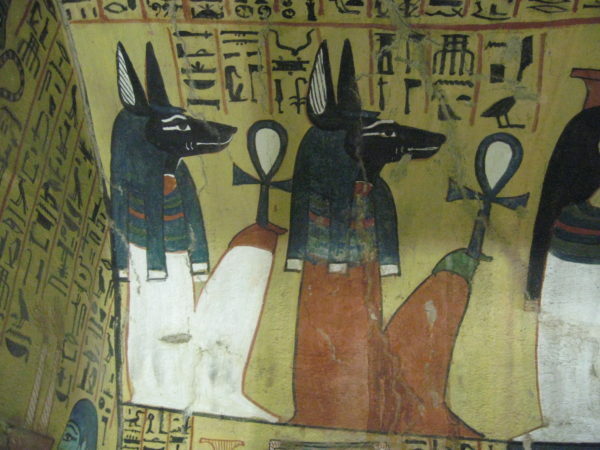 These two jackal-headed figures joined a line of such figures and appear at the top of the decorated walls of the tomb. 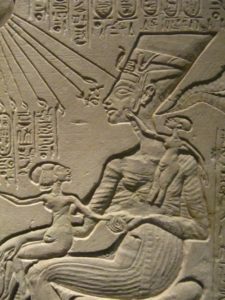 On this detail of a relief showing Akhenaten and his family, two of the rays from the Aten (sun disk) hold an ankh and touch the Principle Wife Nefertiti. 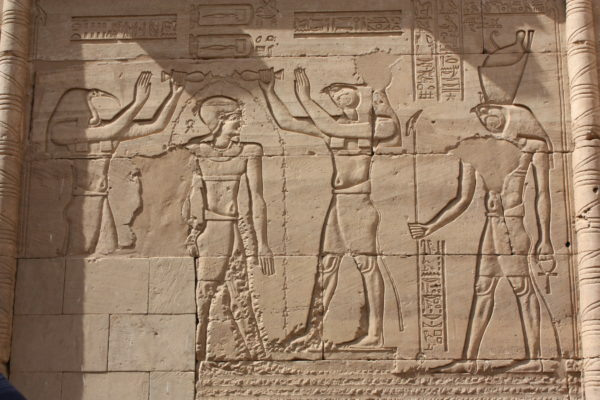 The same symbolism occurs in one of the, now damaged, tomb reliefs at Akhetaten (below). 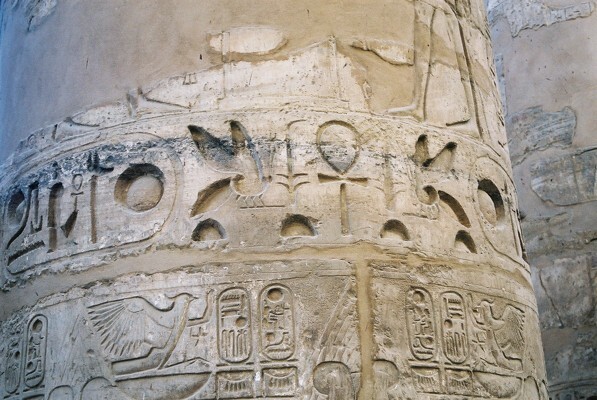 On some reliefs from this period the sun disk replaces the loop at the top of the ankh. In these instances the Aten and the ankh merge to show the power of the sun disk in giving life. The ankh also appeared on oil lamps and textiles that date to the post-Roman period, and are linked to the form of Christianity that was developed in East Africa- the Coptic Church. There are many links between ancient Kemite religion and early African Christianity, and we know that many people in Egypt still made reference to the traditional animistic religion after converting to Christianity. For many people of African heritage, especially amongst the Diaspora, the ankh remains an important symbol and is worn with pride. It connects people with their past and also shows a level of consciousness of claiming back an African cultural heritage. Thank you for you work and enlightenment to us all. So basically the Coptic Church has its origins in East Africa. Is there a relationship between Coptic Church and Ethiopian Orthodox Church? When looking at previous theories about Ancient Egypt from anthropologists more likely ( Egyptologists for eg. Mostly Europeans who started to study the culture at the beginning of Egyptology) it seems as though their theories are poorly researched and contradicting because there isn’t a clear understanding about Africa and its culture. At one time perhaps even today many people still think elongated heads were a deformation of the head naturally not understanding it was body modification ( head binding) an ancient tradition still practiced today by Africans who uphold their culture, red ochre on the skin , there was a theory about their hair ( something about lions hair being used as for wigs or that the afro type hair worn in afro hairstyle were caps not actual hair, circumsion – I have seen alot of people claim it as homosexuality not actually understanding the paintings etc) lots of contradictory theories that makes you question your sanity when the evidence is in our faces just by looking at other African cultures. Your blogs are always accurate and well understood, contrary to the first Egyptologists. There is always hard evidence to support your findings. Great Article Aunty Sally. Hi Stephine, thanks for your comments and questions. As for the Ethiopian church- I’m out of my depth I’m afraid and happy to admit it! I know from visiting monasteries in Egypt and talking to the Elders of the Coptic Church that Christianity came to Egypt in the first century CE, which is when it arrived in other parts of Africa. It is my understanding that the Alexandrian (Egyptian) orthodox church and the Ethiopian had the same administration from the the 4th century CE. As for your comments about Egyptology as a discipline, yes it is incredibly isolated and restricted in terms of how it interacts with any other African, ancient or contemporary, cultures. I think that part of the problem is that as academics we spend years specialising in one culture and often a small part of that culture. And to some extent the discipline of Egyptology encourages people to do so. Academics in humanities subjects often seem to view people who have more than one area or culture of specialisation with a degree of suspicion. When I first obtained my PhD, and was attending job interviews I was asked on one occasion whether I defined myself as a Classicist or an Egyptologist and whether, if I was offered the job, I would be prepared to ensure that I specialised in the latter. Fortunately I found two other employers who had a bit more vision in terms of the benefits of being able to research both areas. Not to mention that the two overlap. I have found it really helpful to expand my academic studies but I’m afraid that as I’ve moved into the social sciences I find the lack of theoretical frameworks and methodology in Egyptology as a whole are concerning. But they also explain why some within the discipline refuse to accept their core subject as African.